Ponte Vedra has long been recognized as a destination for quality golf and family recreation on the East Coast. Our are features over 70 golf courses, the PGA Tour Headquarters and THE PLAYERS Championship. But if golf doesn't pique your interest, we're still the perfect place for your next family vacation, romantic getaway or gathering of friends as there’s sure to be something for everyone! Beach-goers have miles of white sandy beaches for fun in the sun, adventurer's have water sports, hiking trails and living history to explore. Browse our local shops and enjoy the outstanding selection of local restaurants Ponte Vedra has to offer guests and locals alike. Our year-round calendar of events keeps things fun and active. Community First Seawalk Music Festival Salt Life Fest - Celebrate the "Salt-Lifestyle"
Not too far to the south, the quaint town of St. Augustine offers visitors an opportunity to step back in time and walk the cobble stoned streets and shop the old town where early Spanish settlers roamed hundreds of years ago. A visit to the 17th Century Castillo de San Marco, the San Sebastian Winery, and Florida’s #1 Guided Tour – the Ghost Tours of St. Augustine will provide and unforgettable experience. The city also has one of the nation’s largest outlet malls and is host to the World Golf Village as well as the World Golf Hall of Fame. Just north is Jacksonville offering guests and visitors a variety of attractions including the Jacksonville Landing, the Cummer Museum of Art, the Museum of Science and History, the Jacksonville Zoo and Gardens and a number of sporting events and concerts. With everything Ponte Vedra Beach has to offer you might just be tempted to call this area home. 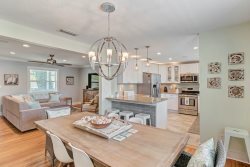 Ponte Vedra Beach is considered one of the most luxurious and prestigious recreational and residential destinations in Florida, if not the entire country. It was voted Money Magazine’s “Best Place to Live in Florida” and among the top 50 places to live in the United States. With above average income, low crime rate and top-performing schools - This is a Great Place to Live and Work! If it's just a Week, a Month or Forever...let us help find your Castle! A list of our favorite places to eat!